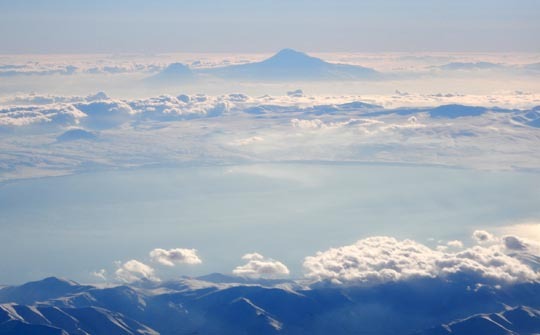 Flying from Dubai to Baku in Azerbaijan late last year a wonderful view of Iran’s snow-capped Mt Damavand popped up in my Fly Dubai 737 window. ▲ A few months later (ie just a week or two ago), flying from London to Singapore there it was again, this time I was flying across the Caspian Sea from Azerbaijan to Turkmenistan and it was rather further away from my Singapore Airlines 777, but still a great view. ▲ An hour earlier another notable mountain made an appearance. 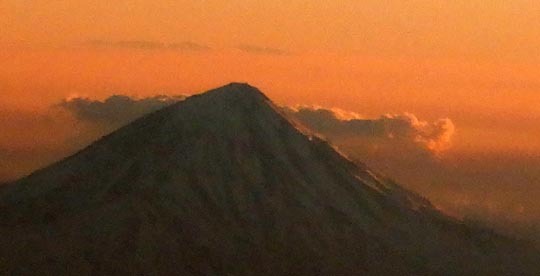 This time it was Mt Ararat, where Noah popped the Ark down as the world dried out after the great deluge. We’d crossed the eastern edge of the Black Sea and were flying from Georgia into Azerbaijan as I looked south across Lake Sevan to the mountain. I’ve seen Mt Ararat a couple of times before from the road between the Iran border and Doğubayazit in Turkey, eastbound following the hippie trail in 1972 and westbound following the Silk road in 2017. 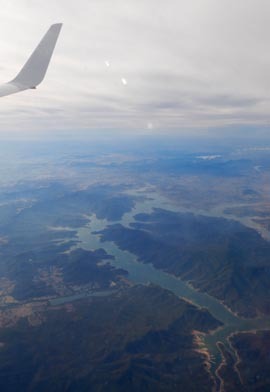 ◄ A few days later coming in to Melbourne from Sydney on a Qantas 737 there were fine views of Lake Eildon, the reservoir lakes for the city of Melbourne which often shows up on the final descent into Melbourne.